Call for Expression of Interest under the EU for Youth Employment and Entrepreneurship in the Western Balkans is now open! 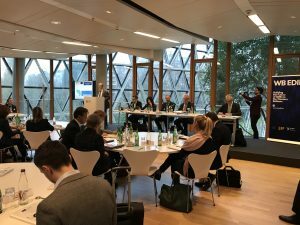 13th WBEDIF Platform Advisory Group meeting took place on 5 December in Luxembourg, at the premises of EIB and hosted by EIF. PAG has discussed the results of WB EDIF to date and the future strategy of the platform for the benefit of the target beneficiary economies. A short movie has been created at this occasion, which will be released soon! Today in Belgrade, the EIF endorsed the selection of five local banks (Raiffeisen bank, UniCredit bank, Banca Intesa, ProCredit bank and Komercialna bank), which will implement the “EU for Serbia – financing for SMEs” Guarantee. 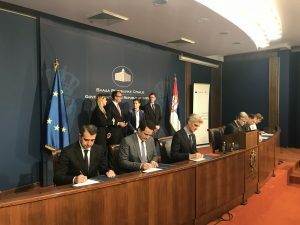 The event took place in the presence of the Prime Minister of the Republic of Serbia, Ms Ana Brnabić, the State Secretary in the Ministry of Economy, Mr Milun Trivunac, and Ambassador and Head of Delegation of the European Union to the Republic of Serbia, H.E. Mr. Sem Fabrizi. Deputy Ambassador of Republic of Poland to Serbia, Mr Andrzej Kindziuk, announced that his country will host the next year’s Berlin Process Summit in the city of Poznań, due to its economic and historical significance. The announcement came during the event on the future of Berlin Process, organised by the European Western Balkans portal. The fifth Berlin Process Summit, hosted by the United Kingdom, got underway with a meeting of Economy Ministers in Vienna on 4 July. Discussions in Vienna focused on how the Berlin Process could best support economic growth in the region, including through the implementation of the Western Balkans Multi-Annual Action Plan for a Regional Economic Area Plan – a proposal agreed at the 2017 Berlin Process Summit to allow for the unobstructed flow of goods, services, capital and highly-skilled labour across the region, so as to promote investment and trade. The first WB EDIF Business Forum took place in Belgrade on 26 June 2018 as part of the 12th WB EDIF PAG meeting. The Forum was hosted by the Ministry of Economy of Serbia and the Chamber of Commerce and Industry and took place under the auspices of the European Commission with the support of the EIF. The event gathered more than 150 participants from the entire region, including officials from the beneficiary economies, EC, EUDs, IFIs, Chambers, banks and finance providers as well as a number of SMEs. Several panels were organized to learn more about what WB EDIF has to offer, to hear stories from the companies benefitting under the facility and to discuss the main access to finance challenges. The Forum was opened by the President of the Chamber of Commerce, Marko Cadez, State Secretary of Ministry of Economy of the Republic of Serbia, Branimir Stojanovic and Head of Cooperation at Dele-gation of the European Union to Serbia, Ingve Engstrom. A business to finance event was organized in the afternoon, where the SMEs from the Western Balkans had the chance to meet the finance and advisory providers under the WB EDIF. The 11th edition of the most significant conference of Private Equity and Mergers & Acquisitions opportunities for the Southeast Europe region will be held under the theme “SEE – Still a land of opportunities?” and it has been scheduled for October 2018. The forum will deliver the highest quality content and address the most current topics related to investment opportunities in Private Equity and M&A space. On 10 July 2018 the UK will host the Western Balkans Summit in London. The summit will bring together the leaders of the Western Balkans countries and like-minded European partners to strengthen security co-operation, increase economic stability and encourage political co-operation. The EU-Western Balkans summit will take place in Sofia, Bulgaria, on 17 May 2018. The summit will be centered on the theme of connectivity with a view to improve the links with the Western Balkans and within the region.